A rangefinder is a piece of equipment that belongs to an innovative class of technology. This handy device has been evolving over the century now, and while the system, in itself, may have arisen close to a century ago, it has only become popular lately. A rangefinder proves to be useful in quite a few situations, but in particular, they have become an extremely helpful tool in a variety of fields such as archery, golf, and hunting. The downside, however, is that there are several of these on the market. For someone who does not have much knowledge about this equipment, it can be terribly confusing to have to choose one among so many options. Thankfully, you don’t have to stress yourself about that as we will be reviewing the Uineye Laser Rangefinder in detail. Uineye is a U.S.-based company that specializes in the field of rangefinders along with other optical products. They have been around for more than a decade doing independent R&D and production capability. All the products from this brand are made from high-quality materials and comply with international quality standards. In addition, they are all fully tested to ensure that you get the best possible quality. Do you think the Uineye Laser Rangefinder is the right model for you? Let’s check out its many features to find out! The Uineye Laser Rangefinder comes with a ton of features and specifications that could easily make it among the top rangefinders currently on the market. The Uineye Laser Rangefinder is quite a simple-looking equipment with no extra frills attached to it. You get three color options to choose from, which include gray, black, and white. The whole body of the rangefinder has a compact design that is made from highly durable materials. It boasts a water-resistance mode as well, which means that you can comfortably use this device even during heavy rains. The Uineye Laser Rangefinder is a Class 1 laser with an average output power of <0.315mW. The laser’s wavelength is 905nm, and it has an eye relief of 12mm. It runs on a 3V CR2 battery that is not included with the equipment. Weight is an important factor for a rangefinder as no one wants to carry around additional weight. This rangefinder only weighs 0.4 pounds, which makes it easy to fit in your bag, whether you want to use it for golfing or for hunting. When you choose the All-in-One mode, it will display the height, actual distance, angle, and the horizontal distance all at the same time. This makes it supremely convenient when you want to shoot quickly. No one wants to use a complicated rangefinder, especially when he or she has to find the target quickly. For this reason, we liked everything about the Uineye Laser Rangefinder, starting from the dimensions itself. It measures 5.9 x 4.3 x 2.5 inches, making it easy to hold with one hand. This is especially great when you have to aim and target with little time in your hand. For added convenience, the rangefinder comes with a tripod socket and a belt clip. Fix it on, and you can completely forget about it until the next time you have to use it. If you forget to switch off the rangefinder, you don’t need to worry as it automatically shuts off after 20 seconds of inactivity, thus saving the battery power for you. The Uineye Laser Rangefinder will provide you with accurate readings. The range on this unit starts from five yards and goes all the way out to 1600 yards with a +/- 0.5-yard accuracy. Along with that, the rangefinder also comes with an 8x magnification along with a 24mm optical aim lens. This will bring you a crystal-clear view of your target. This makes it absolutely perfect whether you want to hunt or golf. In addition, the finger-intuitive modes of operation and multi-coated optics of this equipment make this rangefinder quite reliable for the golf players. The rangefinder is capable of measuring angles that are between -90° and +90°with +/- 0.35° accuracy. What we liked about this rangefinder is that it comes with multiple measurement modes such as angle, distance, height, and horizontal distance measurement. The SCAN mode on the unit will allow for a constant measurement of multiple targets or even a moving target. The Uineye Laser Rangefinder will help you easily fix the target with its high quality 8x magnification. It is perfect to be used for golfing as well as for hunting trips, thanks to the fact that this equipment can simultaneously measure the vertical and horizontal distance. What’s more is that it is made only from high-quality materials, and its water-resistant feature ensures that it can be used in the rain too. Lastly, its light weight and compact size make traveling around with this rangefinder quite easy. To ensure that you are getting the best product, it is essential that we put the Uineye Laser Rangefinder to test. We found that the Kotso Hunting Rangefinder is an ideal match to compare it with. Other than the dimensions and the weight, we found that both these equipment aren’t too similar. For starters, they have extremely different colors and design. What really sets these two apart and makes the Uineye Laser Rangefinder the better equipment is that it comes with an 8x magnification while the Kotso Hunting Rangefinder an only do 6x magnification. Furthermore, the Kotso Hunting Rangefinder runs on two AAA batteries, which isn’t as powerful as most people would have liked it to be. More than that, it also does not feature a dual display like the one from Uineye Laser Rangefinder. With the Uineye Laser Rangefinder, you no longer need to look elsewhere for a rangefinder as this one comes with all the top features you will ever need—and all while being budget-friendly too! 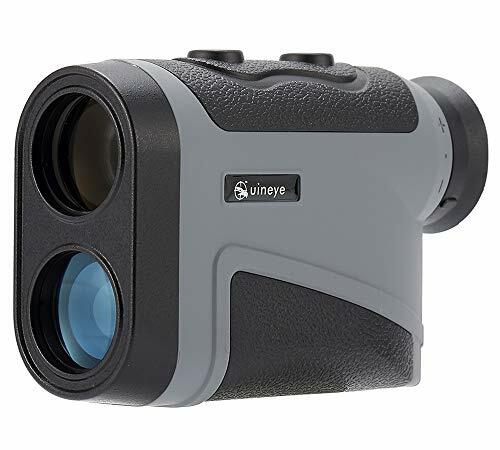 The Uineye Laser Rangefinder is built to withstand tough use and comes with some amazing features like a dual display, 8x magnification, and a compact body. We highly suggest you try this rangefinder as we are sure you won’t be disappointed with it.